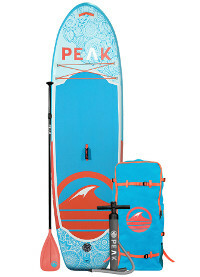 In the world of stand up paddle boards’ industry, the name PEAK is an equivalent for quality. It’s a name dedicated to make some of the neatest and strongest iSUPs out there. 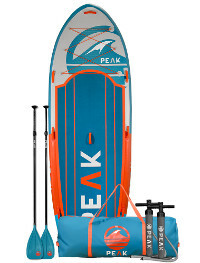 Hence, it only makes sense that we make this guide to review their iSUPs’ line and offer a closer look for anyone who’s interested in PEAK’s inflatable paddle boards. Big guys get to go through first; it’s just a matter of which is most noticeable. The Titan Royal Blue is a head turning iSUP that’s guaranteed to both; upgrade your paddling experience and bringing so much more joy to your weekends and holidays. This is a family iSUP par excellence. Friends who enjoy water activities together are sure to appreciate it too. The Titan is 12 feet long, 45 inches wide and 8 inches thick. This is seriously something similar to a floating platform that can take up to 4 riders with a total weight capacity of 500 lbs. This board is featured with 9 carry handles and one of them is central and it’s meant to make carrying the board single handedly a possible thing. Also, there is a huge traction pad that covers most of this board’s back; everyone will safely stay on board. This pad is super soft and grippy which will make long periods of time spent on it nothing but a pleasure. There is a front storage area that consists of 6 rigid D-rings that are connected with a bungee cord and a five-fin navigation system with a removable large central fin for easy packing and storing. Now in terms of quality, this board is made of a dual layer military grade PVC material that’s the toughest material known to making iSUPs. Not only that; the premier quality drop stitch that’s used here adds immensely to the board’s rigidity and durability. We can openly admit that the Titan Royal Blue is a virtually indestructible giant SUP board. The Expedition is too on the big guys’ lane though nothing really compares to the Titan. Our second board is 11 feet long, 32 inches wide and 6 inches thick which all are some amazing dimensions when it comes to an inflatable SUP. With a weight capacity of 275 lbs; 2 adult riders can enjoy a tour together or you can just go on your own with all the cargo you need on you. 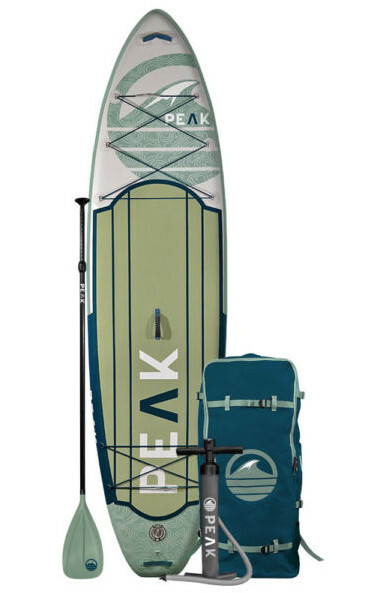 This is a board designed for long distance touring and exploring with a great performance when it comes to stability and versatility making it a great choice for beginners and intermediate paddlers who are looking for a good upgrade for a better paddling experience and more adventures. The navigation system on the Peak Expedition allows it to adapt to different water conditions while still be fully under control with the possibility to perform nice and some swift maneuvers whenever there is a chance. The built quality is real; the drop stitch and double layers of heavy duty PVC material make the board look like it screams strength and durability right in your face. It’s impossible not to notice how neat and precise details are here; everything is perfectly glued to look like one single piece of art. The Expedition comes in 2 colors; moss and aqua and both look too good to be true. Looking at the board, there is the traction pad that’s known to PEAK iSUPs; it covers the whole back except for the storage area on the front. It’s very soft to maximize your comfort during long distance touring. The bungee system is impeccable here; 6 stainless steel D-rings and a bungee cord on the front and another 4 d-rings at the pad’s end as well, plus an extra D-ring to attach the leash. This is the ultimate storage capacity any iSUP can get. You’ll also get 3 carry handles on the Expedition and a trio-fin navigation system where the central fin is large and removable while the other 2 side fins are fixed. A 9-inch fin and a bonus water proof phone carry-case. And they all match the board’s color for better aesthetics. An all-round iSUP by the PEAK never fails to get its job done. The third board on our list is quite a popular one for both its performance and practicality. 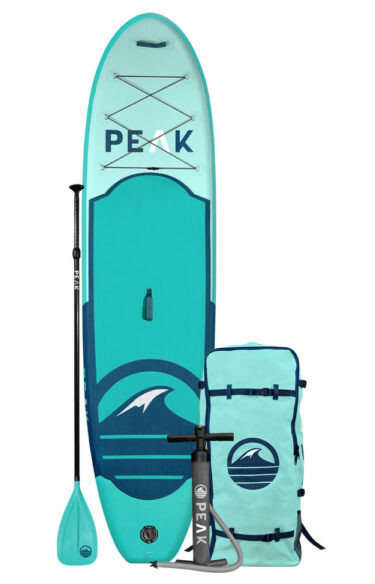 The PEAK All-Round is 10.6 feet long, 31 inches wide and 6 inches thick, and this by far is one of the best inflatable paddle board for first time paddlers. The All-Round is a successful choice for anyone who wants to pick up on stand up paddle boarding, or if you’re simply interested in making yourself some water recreation time. 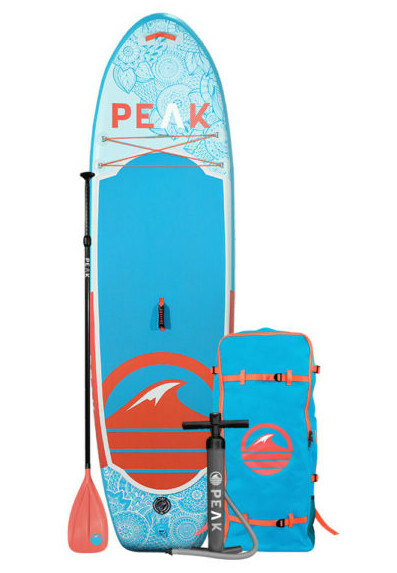 With a weight limit of 300 lbs, an entry level user or a paddler with intermediate skill level will have plenty of things to do once they get their hands on this iSUP; surfing for example, touring or even fishing because this board is THAT stable and maneuverable. The All-Round comes in 3 colors; Aqua, Blue and White and take it from me; nothing looks more neat than these boards do. The features here are complete and ultimate and we can start with the brushed EVA traction pad that’s thick and soft adding to the board’s stiffness and rigidity. Also, the bungee system consists of 6 solid D-rings on the front where all of your cargo is guaranteed to fit. Now since the All-Round is not as big, there are only 2 carry handles and they’re more than enough to transport the inflated board anywhere you go single handedly. And finally, there is only one large removable fin on this board and users from all over the board approved that water cruising and tracking were the least to say great and smooth. Now look at this beautiful graphic design; the PEAK Yoga Fitness iSUP is definitely an attractive colorful iSUP that’s guaranteed to be the best buddy to many of you yoga enthusiasts out there. The Yoga Fitness is 10 feet long, 32 inches wide and 6 inches thick which are numbers specifically chosen to meet yoga needs. Any routine can be successfully performed on this board because 10 feet is a lot of space for anyone to sit, stretch and lie down. However, a board is not a yoga board unless it’s stable enough even for a beginner to pull a trick or two. The Yoga Fitness is 32 inches wide and that’s by norm the best any brand can offer. Moreover, you can load up to 275 lbs on this board without affecting its performance, and that could be your pet on board, or a small companion. 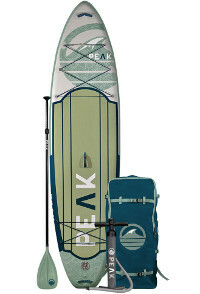 In terms of features, and though this is a yoga paddle board, it happens to lack nothing that makes stand up paddle boards as special as they are. You’ll find a 4 D-rings bungee system on the front so that it’s possible to secure your paddle or any other needed item to the board. Also, there’s a safety leash D-ring on the tail, 2 rigid and padded carry handles for easy transportation and finally, the Yoga Fitness is featured with one single removable fin. Now because you’re not going to stick to yoga all the time; you’d want to go touring somewhere nice or maybe go to the beach. This fin is going to make cutting through water a lot easier and smoother so that the board can be multi-functional and versatile. Thus, using the board in flat or choppy water is as comfortable and fun as killing a yoga routine. 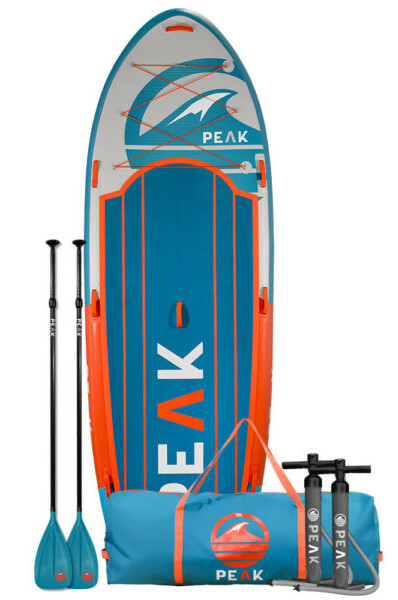 These were PEAK’s best inflatable SUPs which obviously cover most if not all of water activities that any of you might enjoy. 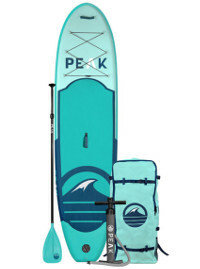 The best thing about each one of them if definitely the complete and attuned package that’ll make sure you paddle your way with style, and also the fact that each and every one of them is virtually indestructible thanks to the PVC double layers and light weight drop stitch material. It was a great experience getting close and testing these luxurious and durable iSUPs which didn’t fail in any way to deliver their best performance.